Friday and Saturday: 10 a.m.-6 p.m. The Farmington Community Library is seeking a Part Time Technical Services Page. Please see the complete job description for more details. Application deadline: Wednesday, April 26, 2019 at 12:00PM. The Farmington Community Library is seeking a Full Time Payroll Benefits Specialist. Please see the complete job description for more details. Application deadline: Wednesday, April 24, 2019 at 5:00PM. The Farmington Community Library is an equal opportunity employer. It is the Library's policy that all decisions affecting employment are made without regard to an individual's race, gender, color, religion, marital status, family responsibilities, veteran status, age, height, weight, national origin, disability, genetic information, or other classification protected under federal, state, or local law. The Library maintains about 30 full-time, 26 part-time, and 40 page positions. Application forms for employment at the Library are available at the Circulation desk at both buildings. Forms are also available here for those interested in employment with the Library to print out and complete. Best viewed in Chrome, Firefox or Safari Internet browsers. Library Page positions open from time to time, and applications are accepted throughout the year. Library Page compensation starts at $9.45 per hour. Pages may be assigned to work 12–16 hours each week, with hours scheduled during normal Library hours, including nights and weekends. The earliest history of library service in Farmington was never recorded. Little is known other than that school libraries served the populace; teachers hand-delivered books from the school to people who were interested in reading. We only know that such libraries existed because it is noted that they were "re-established" in 1881. This "re-established" service is not comparable to library service offered today; books could be checked out beginning Saturday, December 17, 1881, and every other Saturday thereafter, between the hours of three and eight o'clock. Patrons were limited to one book per person for a two week loan period, with a fine of $.05 per week if the book was overdue. This situation was to continue for the next thirty-two years. During that period, in 1908, a state law was passed which provided for the establishment of at least one library in each township and city. Per the 1835State Constitution, city, township, and county fines assessed and collected for any breach in the penal laws were to be exclusively applied to the support of public libraries. The matter of penal fine funding was overlooked by Farmington authorities, until it was brought to the attention of the Township Board by two teachers, Martha M. Schroeder and Andrew Crosby. The Board was agreeable to the idea; proceeds of the fines were thereafter earmarked for the library. As a result in 1913, $2.11 was authorized for library purposes. However, in 1913, the city fathers were forced to recognize the need for library facilities. The Farmington teachers, having decided they could not teach and be librarians too, brought the contents of their libraries to the Town Hall, and stored them on the vestibule floor. Faced with a problem that could not be ignored, the Trustees turned the matter over to Martha Schroeder and the Ladies Literary Club. Six hundred dollars was allocated to be shared by the library and the cemetery; the cemetery was to receive first priority. As this did not provide enough money to hire a librarian, the ladies worked voluntarily to run the Library, and assumed the job of raising money to maintain it. The women organized the Ladies Library Association, which was sanctioned by the Board of Trustees, as the official group in charge of the library. To raise money for library operations, the Association charged dues of 25 cents, and sponsored lectures and other entertainment. As a result, the Library operated on a budget of $140 in the first year. The Sunday School room of the Baptist Church on Farmington Road and Shiawassee was rented for $12 yearly to serve as the library facility. It housed the original collection of 800 volumes, plus the additional 100 volumes added the first year, at a cost of $41.38. The women repaired and rebound books themselves. When the first year was over, $14.80 remained unspent, including the $2.11 in penal fines. As a librarian was needed for the library, Mary A. Kennedy was appointed to "temporarily" fill that position; her tenure lasted 25 years, ended by her death. For much of that time, hers was an unpaid position; eventually she was granted a small salary by the Township. From the beginning, the library experienced growing pains. The Sunday School room was soon inadequate. To alleviate the problem, an addition to the Town Hall which was to serve as the library, was authorized in 1915. But World War I brought with it building restrictions, and the addition was not completed until 1919. In the meantime, conditions in the Sunday School had become hopeless; the library moved, temporarily, into the basement of the town bank. Finally the library was moved into the new wing of the Town Hall where business continued as usual until 1938. When Mary Kennedy died on April 12, 1938, the library was closed for reorganization. This reorganization included setting up a budget for the library, to which each government unit would contribute equally. A Board of Trustees was established to manage the library; it consisted of three members from the city and three from the township. Mrs. Anna (Fred L.) Cook was the President of this Library Board, and she would serve from 1938–1956. A representative from the Michigan State Library was called in for advice and assistance. Old books were discarded, furniture was sold, and a new librarian's desk was purchased for $27.50. The library was organized to meet specified requirements to qualify for state aid; one such requirement was that a salaried librarian be employed. The position was filled by Mrs. Florence Leach, a Farmington resident who had been trained in library work at Franklin College in Indiana. Her salary was $6 per week. Another requirement regulated library hours; the library extended its hours to be open on Wednesdays as well as Saturdays. From the period of reorganization to the mid-fifties, funding remained a problem. In 1938, the city and township together contributed $600 for operating costs; by 1955 the amount was ten times that and still woefully inadequate. The book collection grew to 4,500 volumes in the ten years after reorganization. Fortunately, about fifty percent of books were on loan at any one time, otherwise there would have been no place to put them. The problem steadily worsened with the great flight to suburbia which followed World War II. As the new residents poured in, the need for increased library services and larger facilities became greater, with no relief in sight. On August 16, 1954, a similar gift was left by Miss Ruth Carlisle, a former Detroit teacher and Farmington resident. Her will provided for "the residue of (her) estate... to go toward the building fund of a new Public Library in Farmington City and Township"—a gift which amounted to $12,133. Thus, here was a possibility that funds might be available for the construction of a library building, if Mr. Wilbur's bequest was not used for a hospital. An examination of the potential Wilbur assets showed that they would be insufficient to fund even a small hospital, but would go a long way toward financing a library. The Library Board decided that the paragraph in the Wilbur will should be publicized to gain the communities' attention and support; this was done through the newly-organized Farmington chapter of the American Association of University Women (AAUW). The group sponsored a talk given by Mrs. Frances Noonan, of the State Library. In her address, she suggested the formation of a Friends of the Library group. The suggestion was quickly acted upon; the Friends of the Library organized on October 5, 1952. The Friends concentrated their attention on furthering the cause of the library by launching a membership drive, sponsoring speakers, and openly soliciting donations for the library. Mary Allison The question of a hospital or a library was not resolved for another two years. On June 15, 1954, a group of interested residents met in the city council chambers. The Library Board and the Friends presented their case to Mayor Kenneth Loomis, who appointed a committee to make a complete study and report to the city and township governing bodies. Chaired by Edward Moseman, the members were Mrs. Clarence Stole, for the Library Board; Harold Whiting, for the Friends; Supervisor Ernest Blanchard, for the Township Board; and Councilman James Cavanaugh, for the Council. Mary C. Allison, who would be a prominent figure in the fight for libraries in Farmington, was designated as secretary. The committee submitted its findings in a six-page report which aroused wide interest and paved the way for future action. Eventually it was decided that the funds should be used for a library, partially because a hospital that would serve the area was being projected for Livonia. Two obstacles immediately arose, however. The first was that between the date of Wilbur's will and the date of his death, the City Commission, which was to be entrusted with the administration of the funds, had been succeeded by a City Council. The second question was whether the library could be operated as a joint city-township venture as it had been in the past, or must it be a strictly city venture, excluding the more populous township? This was complicated by the fact that Michigan law did not specifically authorize two units of government to establish an official library board with customary powers. It was this second problem that was resolved first; through the efforts of Friends' director Wendell Brown, the State Legislature passed a special act, No. 1364 on June 7, 1955, authorizing two or more municipalities to operate a library jointly, and to set up a district library board with comprehensive powers. Within a few weeks the City Council and Township Board passed resolutions to create a district board; each unit appointed two members. Farmington District Library became the first district library in the state. District libraries have since become the preferred form of library establishment law, with many districts forming or re-forming through the years. The first obstacle remained to be dealt with. The Wilbur estate had long since been closed by Probate court, with its assets turned over to the city of Farmington. Now, at the insistence of the new Library Board, the Circuit Court was asked to reopen the case and hand down a judicial construction of the paragraph in question. The court decided, on February 11, 1957, that the assets of the estate should be released by the city to the new Library Board. After the decision, the Board president, M. C. Goodard Smith, called for a survey of assets. The township had authorized a tax levy of .3 mill for the administration of a new library district in February, 1956, which was expected to raise $10,400 yearly. The city agreed to pay from its operating budget an amount equal to the same millage on property within its borders. It was presumed that State Aid would continue. The residue of the Carlisle Estate, amounting to $12,133, was turned over to the Library Board. The amount of the Wilbur funds (eventually $75,700) was not immediately known. It was soon evident that the annual income would be insufficient to maintain an adequate library, and that the funds in hand would not permit the construction of a building anywhere near a suitable size. Contributions were then solicited in earnest with responses ranging from $2.00 on up. In July, 1955 a real estate developer offered a new site to the Postal Service, proposing a new building. If the Post Office accepted the suggestion, the old post office building on Farmington Road would be put up for sale by the same developer. The Library Board and other citizens realized that, with extensive remodeling, the old Post Office might be a suitable building for the library. The realty company offered the building to the Library Board for $40,000 contingent upon the Post Office Department's approval of the new site and new building. The approval came quickly, work began, and the Farmington District Library was dedicated March 2, 1959. The new building was 3,800 square feet, had a capacity for 18,000 books, and included lounge and study areas. The staff was now headed by Mrs. Mildred Droege, who had been hired as an assistant to Florence Leach in 1951, and had taken over after Mrs. Leach's retirement in 1959. The library prospered during the following years, serving the entire Farmington area, but rumblings began as early as 1960, voicing the need for at least one branch library to serve the northern township. The tiny library was understocked and in need of funds, resulting in the request for a .2 mill increase. The proposal was defeated in April, 1961, but was resubmitted and passed in July. Old Farmington Branch By March, 1962, in response to the great population increase in the area and resulting increased demand on library services, the Library Board of Trustees authorized a "Need and Site" survey for library development, which was completed in May. The survey showed that there was a definite need for a library facility in the Township area. Several sites were considered, including a spot near Eleven Mile and Orchard Lake Road, where the Township Offices were located, but it was a five acre site on the south side of Twelve Mile Road that was finally approved and purchased. In October, 1963, the Farmington Area Community House association dissolved, leaving $5,500 to the library building fund, but it was not until April, 1964 that the money was actually received. With such a contribution as the impetus, and crowded, unsatisfactory conditions at the library building demanding attention, the Library Board requested additional millage for library development and expansion. A proposal for .5 mill for 20 years was placed on the ballot to continue operations at present levels, plus an additional .75 mill was placed on the ballot for ten years for the building of a new library. Patronage had increased from 9,000 to 19,000 users, and the book collection had grown from 9,000 to 21,000 volumes. The collection and use was far more than the small library could effectively handle; however, the voters turned down the additional .75 mill proposal, while the .5 mill provision was passed. Set back, but not defeated, the Board revealed plans for improvements at the District Library in April, 1965. The plans included repairs to the roof, repairing the driveway and parking lot, construction of a retaining wall around part of the parking lot and the installation of a photocopy machine. Another boost was given to the library building fund in June, 1965, when the Farmington Valley Saddle Club dissolved, leaving $958.86 to the library. For the next two years, the Library Board considered alternatives aimed at increasing service to township residents. Such considerations included establishing a branch library at North Farmington High School, wherein the school would provide the space, heat and light with the Library Board paying custodial and cleaning costs and salaries of personnel; but this proposal was found unsuitable. The Board also considered leasing the Manufacturers Bank building in the Westbrooke Shopping Center at Thirteen Mile and Orchard Lake Roads; this idea was also rejected. In April, 1966 the library joined the Wayne-Oakland Federated Library System to provide added service to Farmington patrons through access to other area libraries' collections. Though the library ranked twenty-seventh in size comparison with the other member libraries, it ranked fourth in circulation, a demonstration of the high rate of use the tiny library had. By December, 1966 the library had a collection of 25,000 books; by library standards it should have had 80,000 volumes. Again the Library Board asked for a millage increase of one mill for the next ten years, to build a $814,000 building in the township, and an expanded or new $293,000 south building; the north building was to be built first. The proposal was passed on May 22, 1967. Plans for the construction of a new building on Twelve Mile began immediately. Contracts were awarded to Tarapata —MacMahon Associates, architects (later Tarapata —MacMahon—Paulsen or TMP). An application was filed with the Michigan State Library for federal funds, available through the Library Services and Construction Act (LSCA), for an amount of 40% of the construction cost. The site had been surveyed when a major setback appeared; the Library Services and Construction Act funds to Michigan were cut drastically. In October, 1968 the architects were notified to suspend activity until further notice. To complicate the problem, the LSCA was to expire in 1968 and would have to be renewed by a new Congress that was already committed to budget cuts. As expected, the library's application for federal funds was rejected, due to limited amount of funds received by the Michigan State Library for state distribution. In vain, the request was resubmitted. Work on the plans was resumed; it was still felt that the money would come from somewhere. By January, 1970, the decision was made to go ahead with the building, even if there would be no money for books to fill it. An open meeting was planned for April 29, 1970 to discuss the library model and drawings, and for the distribution of a "financial fact sheet", detailing proposed income and expenditures, designed to answer the questions of interested community residents. Groudbreaking for the new Main Libary At the meeting a timetable for construction was outlined, beginning with the awarding of a general contract in June, 1970 and ending with completion by December, 1971. The cost of the building was estimated at $1.5 million. It was projected that by the end of the 1971—72 fiscal year, there would be enough money on hand to pay for the building. It was also revealed that another request for federal funds had been made, but by June 24, 1970, that application also had been rejected. To bring the building cost within the confines of the budget, it was decided that some areas of the basement would have to be left unfinished. On July 8, the Library Board advertised for bids on the Library contract; the contract was awarded on July 23 to Freeman—Darling of Livonia for $1,383,556. Ground breaking ceremonies were held August 30, 1970. Mary Mitchell In November, Mildred Droege announced her retirement. Mary Mitchell, a well-known Librarian, who had worked for many years as Head of Personnel at the Detroit Public Library, was hired by the Board. Mrs. Mitchell's new title was Director of Libraries. As with the first building, a gift drive was established, to raise funds to supply furnishings and books. Major contributors were the Farmington Jaycees, who agreed to furnish the children's room, and the Farmington Rotary Club, which donated $3,000 to furnish the Quiet Room. Other major donations were made by the Friends of the Library and the AAUW. On Sunday, June 11, 1972, the Farmington Public Library was dedicated—the $1.2 million facility opened debt-free! The 38,000 square foot structure has a capacity for 150,000 volumes. The upper of the two levels included a reference area, fiction and non-fiction areas, lounge, Quiet Room and Children's room with a total seating capacity of 170. The lower level housed a meeting room, which could seat 200 persons, kitchen facilities, the Oakland County Subregional Library for the Blind and Physically Handicapped, an undeveloped space, and storage areas. Here is an Online Gallery of photos of the new Library building after its opening. The new building flourished, becoming the center of library activity in Farmington and some adjoining areas, serving a population of 60,000. In September, 1974, Mary Mitchell retired; G. Gordon Lewis replaced her. Mr. Lewis had previously worked at the Youngstown, Ohio Public Library and the Free Library of Philadelphia. With the opening of the Twelve Mile Branch, it was time to again look at the needs of the District Library, as the second provision of the millage proposal mandated. The small library with a capacity for 18,000 volumes, was bursting at the seams, stuffed with 22,000 books. In June, 1973, a site was chosen, at the corner of State and Liberty Streets slightly northwest of the old facility. Two of the three lots needed were owned by the city, which readily approved the sale of the land to the library for $50,000, retaining the right of first refusal if the Library decided to sell the land later. The third lot, without which the library could not be built, was not quite so easy to come by. It was privately owned by Mary Clay, who had turned down an earlier offer by the library board to purchase the property. When the city council agreed to sell its parcel of land to the library, it was asked by the Library Board to help the library acquire the lot. The council agreed to help, first by offering to buy the land at "fair market value" after an appraisal, and if that offer was to be rejected, the council would exercise its legal right of "eminent domain" and take possession of the land for public (library) use. Farmington Branch Construction The land was acquired by the city in February, 1974, at a cost of $34,000; it was resold to the library board for $34,900 which included the cost of acquisition. With this obstacle out of the way, building of the library progressed quickly. In June, 1974, plans for the new building were unveiled by the architectural firm Merritt, Cole and McCallum. Bids were accepted; the general contract was again awarded to Freeman—Darling of Livonia. Ground breaking ceremonies were held December 8, 1974. Farmington Branch Dedication Picture At this time, it was decided that the buildings should have new, more uniform, names: they became, collectively, "The Farmington Community Library" the 12 Mile building became the Farmington Hills Branch, the downtown building was to be the Farmington Branch. 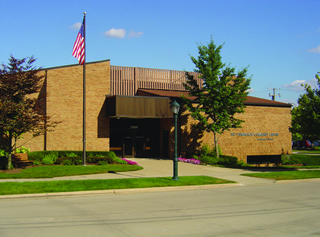 These names would be further modified when the 1999–2003 renovation and expansion project was completed, and the Farmington Hills Branch was renamed the Main Library. The $825,000 Farmington Branch was dedicated December 7, 1975. The lower level of the 18,000 square foot structure houses the children's room, complete with reading tree house donated by the Jaycee Auxiliary, auditorium and local history room. The upper level is divided into the non-fiction room, the fiction room, (which offers a lounging area in front of a stone fireplace), a Quiet Room (furnished by donations from the Farmington Friends of the Library), and a staff work area. Much of his first eighteen months on his new job, Director Lewis was involved in the planning and construction of the new Farmington Branch. Shortly after the Branch opened, Mr. Lewis began effectively examining each aspect of library operations to identify changes that would make the library services more responsive to community needs. Children's programming was completely revamped to follow educational concepts, incorporating a number of age-appropriate activities into six- or eight-week series of registered programs. Twice a year, librarians visited each elementary school to encourage children's participation in the Summer Reading Club and other programs. Quarterly program booklets were developed to highlight the programs for all ages. Public response was overwhelming since there were few leisure programs offered by other community groups in those years. As a result, registered library programs received maximum booking on the first morning that parents could register their children. To further address parents' needs, the Parent-Teacher-Professional Collection was created. The Farmington Hills Branch became the housing agent for the Oakland County Library for the Blind and Physically Handicapped in September, 1973, with an initial 380 handicapped patrons. Within a few years, demand for these "talking books" resulted in registration exceeding 1,000 patrons, county-wide. Library staff working with these special materials also delivered library services to the senior citizen centers and nursing homes in the area. A special collection of large print materials was developed. Other special collections on gerontology and the deaf/hearing impaired were expanded. Large portions of the book budget were allocated to "retrospective" ordering to assure that staff purchased the best titles in each subject area. Since the Hills Branch opened without a basic collection, Mr. Lewis was determined that new purchases would better reflect a high quality of information. The Reference Collection was expanded, with additional special collections developed: the Law Collection was enhanced by a gift from attorney Robert Pugh; the library became one of 130 Foundation Center affiliates nationwide, thereby establishing the Grantsmanship Collection. The Farmington Branch increased its special collection on Michigan and Farmington History. Local historian Kay Briggs greatly enhanced the collection with a donation of over 1,000 rare books and first editions on Michigan history. Muirwood Branch of the Farmington Community LibraryIn April, 1984 the Library began a pilot program, opening a "storefront Branch" in the shopping mall at Muirwood (northwest corner of Grand River and Drake Road). Stocked with popular reading materials, and offering children's programs, the new Branch was the joint inspiration of Jerry Beznos, who operated Muirwood and offered the Library three months' free space, and the Library Administration. However, traffic at the Branch could not justify the investment of staff and materials, and the new Branch ceased operation at the end of June, 1984. In 1986, the family of Robert Cook, another local historian, donated Mr. Cook's lifetime avocation: indexing of the Farmington Enterprise and Observer, 1888 —1980. Mr. Cook noted the births, deaths, weddings, and important events that were recorded in this local news that were recorded in this local newspaper. This resource is considered invaluable! Audio-visual materials were enhanced, with a Friends' donation to create a videocassette collection in addition to 16mm film, 8mm film, filmstrips, records, and cassettes. Also in 1984 the Farmington Friends of the Library purchased the library's first computers—actually, data terminals—which were used to access remote research databases—the commercial Internet forerunners by a decade of what would become the World Wide Web. The library subscribed to advanced online search services such as Dialog, BRS, Lexis, Nexis, Knowledge Index, and BRS After Dark. Staff were trained with new skills to perform database searching during any hour the library was open. The Farmington Community Library was unique among its peers in taking such an approach; other libraries required appointments or only had a limited number of trained searchers. Instead, the Farmington Community Library expressed these beliefs: that electronic information was an important component in library services; that all Adult Services staff should have basic competencies in learning to use these new computer resources; and that staff should market the value of these new resources to the rest of the community. From this perspective, the library was in the forefront of information technology—a position it would maintain from that point forward. Staff held training sessions in the high schools and gave demonstrations to the business community. To encourage use of Westlaw, the legal database; local District Court Judges sponsored breakfasts for area attorneys to encourage training. During the height of the demand for staff-assisted database searching, staff performed over 1,000 searches per year with revenue of $34,000. Each search was offered on a cost-recovery basis which included the telecommunications charges, time in the mainframe computer, plus 20% overhead. The Friends also provided the first computer equipment for the Children's Departments, with educational software and games. It quickly became apparent that children were adept at learning new computer skills. From the early 198 0's to 1996, there were four generations of computers and software purchased for children's use. The Farmington Community Library became one of the highest circulating libraries in the Wayne Oakland Library Federation. Such heavy use soon led to various renovations to fully use the 38,000 square feet in the Hills Branch. In 1977-78, the Library for the Blind and Handicapped was moved to quarters in the lower level, with good access to the elevator for walk-in traffic and for mail deliveries. The public library paid $27,000 for this renovation, with Oakland County paying the remainder of the costs. Board of Trustees in 1980 The Library Board recognized that additional substantial renovations would be required to fully use the lower level of the Hills Branch. Appropriations funding from the City Councils were not fully accommodating the Board's perceived library needs. In May 1979, two issues were placed on a special election ballot: one would have created an independent taxing authority in the Library Board and the second would have granted a tax levy of 1.5 mills for library operations. Both proposals were defeated. At budget hearings the following year, the two City Councils approved funding of $141,000 for relocation of the Children's Department to larger space in the Hills Branch. The Farmington Friends of the Library, as a large group of citizens, attended the Joint City Council budget meeting as proponents of the needed library improvements. Their voices were once again heard! The Children's Department moved to approximately 7,000 square feet in the lower level. A Conference Room, seating 75 people, was added to accommodate some Children's programming and to rent to small groups for meeting room space. Maximum shelving was added in the adult collection. In 1981–1982, the Councils approved purchase of a security system at $28,000 per year for three years, with the Friends also agreeing to financially support this major project. Director Lewis and his staff recognized the operational changes occurring in the library profession. Lewis and the major members of the Wayne Oakland Library Cooperative agreed that an automated library system was needed to replace the manual systems that were labor-intensive and slow. Seven members agreed to pool their monies to jointly purchase access to GEAC, a Canadian-based automation system. In 1983, library staff linked each book in the library collection, creating an accurate inventory for the first time in over twenty years. Library circulation exceeded 500,000 items per year and was projected to only increase! In May 1985, G. Gordon Lewis resigned his position as Library Director. The City Councils chose to exercise their prerogative to increase the total number of Library Board members to eight, with four trustees chosen by each community for four-year terms. Assistant Director Beverly Daffern Papai was promoted by this expanded Board to Library Director in July, 1985: she woud server as Director for the next 19 years until here retirement in 2004. Shortly thereafter she selected Gerald Furi to be the new Assistant Director—a position in which he would serve for the next 26 years until his retirement in December, 2011. Beverly D. Papai, Director 1985–2004 Beverly Papai brought a unique combination of compassion, professional excellence and unparalleled creativity to her leadership of the Library, which would extend from 1985 to her retirement at the end of 2004. She would preside over a period of remarkable growth in Library usage and services, as she shepherded the Library into the Information Age without relinquishing anything of its rich heritage. In early fall, 1985, the new Director and Staff embarked on the creation of the Library's first Five Year Plan, as requested in a joint meeting of the City Councils. Planning included an assessment of staffing needs, facilities, work flow and demographic projections. Both internal staff and patron surveys were taken. An independent consultant conducted a telephone survey to reach non-users. Public support of the Library ranked "important" even by non-users. Efforts were made in the next few budget cycles to increase the level of the staff and to improve their compensation to a level competitive with other similar libraries. The need for increased space in a "main" library building was one of the most critical findings in this planning process. TMP Associates, the original architects of the Hills Branch, conducted a feasibility study for the expansion of the Hills Branch. TMP concluded that a well-planned expansion program was necessary to maintain the level and quality of services that the community requires. Thus, began a multi-year cycle of study sessions with City Council members and the Library Board to review: the need for a larger library; the type of building required; addition versus a totally new building; selection of an architectural firm; site; cost; operating millage; election date; and campaign activities. The discussion of placing library expansion referenda on the ballot was somewhat expedited in May, 1989, when the Governor signed a new District Library Law, Public Act 24, which replaced Public Act 164 of 1955. The Farmington Community Library was given retroactive taxing authority status, which allowed the Library Board to place ballot issues for bonding or millage before the electors of the entire library district. In November 1989, two ballot issues were defeated by the voters: $14.5 million bonding for a new main Library [located on West Twelve Mile, east of the Halsted Road] and 1.5 mills for operating purposes. An analysis of the election results showed voter concern regarding the site. While this election lost by a narrow margin, the Library Journal included the Farmington's campaign plans as a model in their 1990 election issue. In 1991, the Orchard Lake Campus of Oakland Community College hired a consultant to renew the college's master plan. The consultant and Campus President approached the library with a study proposal for a merged public and college library, which could be built on the campus. The next year was spent in analysis and discussion regarding the myriad of arrangements that would lead to a successful joint enterprise. A model joint library had operated successfully for a number of years in Broward County, Florida. Discussions faltered in late 1992 when it became apparent that the college was unable to dedicate funding to the building of the joint library and that labor-related issues could not be resolved. Continuing frustration with inadequate public seating, insufficient parking, and a lack of shelving space to house the collection led to a second ballot proposal in August, 1993. Again, the proposal requested approval of a new main library at a new location, as well as operating millage. The site this time was central to the community–on property owned by the City of Farmington Hills on Orchard Lake Road, south of the 1-696 expressway and directly across from the entrance to Oakland Community College. Again, these proposals were defeated. Again, the public commented on dissatisfaction with the proposed site. In 1994, the Hills Branch received a face-lift with replacement of 1980 carpeting and relocation of library shelving to make better use of the space available. The catalyst for this renovation was the relocation of the Library for the Blind and Handicapped to a new county library in Pontiac, MI. The Library Board approved a plan to use the 2,000 square feet then vacated by the Library for the Blind. Cost of the renovation was $271,000, with the majority of those monies expended on new carpeting. Library Design Associates assisted with the space planning for relocation of library areas. Fiction and audio-visual materials were moved to separate rooms. For the first time in years, staff members had individual workstations for their responsibilities when not working at a public desk. Consideration was given to the usability of the various changes for any future expansion effort. At the request of the two City Managers, the Library Board reactivated its Building Committee in the spring of 1995 to consider a proposal whereby the City of Farmington Hills would purchase 2 + acres adjacent to and west of the existing Hills Branch. Such space would be required if the Library Board chose to expand its current building. The Building Committee, with the City Managers participation, selected the firm of Luckenbach/Ziegelman and Partners to prepare a feasibility study of an addition to the building. The Board also hired Library Design Associates to recommend space requirements for an enlarged library operation. By the end of the summer, the City purchased the property, to be reserved for future library needs. Yet another election for library expansion would be held before the end of the century. The Library's history was shaped by caring people who viewed a public library as integral to the community's quality of life. From early teachers to the Ladies Literary Club to the AAUW and other service groups, a few individuals emerged as leaders in the library's history. Wendell Brown fostered the creation of the first District Library Law, which would impact upon the governance of many public libraries statewide. He also was instrumental in the incorporation of the Farmington Friends of the Library, whose membership exceeded 1,200 by 2009! Library Board members throughout the years showed perseverance and determination to build for the future. Such dedication is perhaps best characterized by Ernest E. Sauter who was first appointed to the Board in 1964 and continued to serve until his death in 2008. The focus on good public service was nurtured by early librarians Mary Kennedy, Florence Leach, and Mildred Droege. Directors Mary Mitchell, G. Gordon Lewis, and Bev Papai expanded the library's traditional role to also include new programs and information technology while still maintaining the strong public service values. Governmental leaders in the cities of Farmington and Farmington Hills continue to demonstrate support for the Farmington Community Library, both financially and by appointing Board members who are concerned about the entire library district. The Farmington Community Library, through its Board and Staff, worked to meet public library needs for the millennium—while remembering its fine heritage of service to the community. In 1992 the Library decided that the response time and reliability of a Library Catalog and Circulation System shared with the 60 other libraries in the Wayne-Oakland Library Federation was not in our best interest, and we switched to a self-sufficient system provided by DYNIX a privately-owned firm from Provo, Utah. The DYNIX system would serve the Library well and faithfully until the DYNIX company was sold and acquired by a much larger firm in 2007. 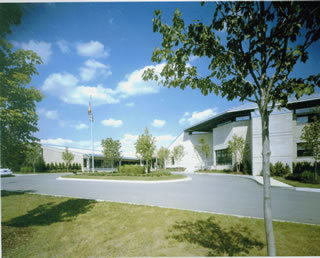 In 1993, the Farmington Community Library and six other Metro Area libraries—Birmingham, Bloomfield Township, Canton, Independence Township, Rochester Hills, and Southfield— joined together to form the Metro Net Library Consortium, Inc. Metro Net, chartered as a Michigan non-profit corporation, was created to share resources and explore applications of technology to improve library services. Farmington Community Library functioned as the electronic hub for the Consortium, hosting a Gopher server (precursor to the forthcoming World Wide Web server) in late 1993, and in, 1994, became one of the very first public libraries to have its own Web site, initially shared by the Consortium, but within two years time offering our own Web site for our users. Metro Net also provided free dial-up access to Library resources for Library users—a service which would be continued until late in 2010, when the prevalence of broadband access made dial-up a relic of the past. From 1972 to 2008, the number of Library cardholders increased 157%, and the circulation of books 134%. In response to a survey sent out in February, 1998 to every household in the community, residents said they wanted more materials, services and space that the Library could currently provide. So on August 4, 1998, the Farmington Community Library asked the voters to approve an $11.7 million, 15-year millage (.6 mills) for renovation of both Branches and expansion of the Main Library. The millage was overwhelmingly approved, and renovation began with the Farmington Branch. The Farmington Branch was rededicated on November 7, 1999. As mentioned above, a gallery of pictures of the renovated and expanded Main Library are available online. Beverly D. Papai, Director 1985–2004Beverly D. Papai retired at the end of 2004, and Tina Theeke was named as her successor by the Board. Ms. Theeke served for nearly twenty years at the Library, and was Branch Head at the Main Library before becoming Director. She has brought her unique qualities of highly intelligent leadership, quiet competence, openness, and consensus-building skills to the position. With the building expansion and renovation project successfully completed under Bev Papai, the Library's Director and Board of Trustees were now faced with the need to establish secure long-term funding for the Library in the face of declining revenues on the part of both cities. From 2002 through 2005 the Library experienced serious budget cutbacks amounting to over $650,000, due to decreasing appropriations from the Cities reflecting increasingly difficult economic times and the cessation of Federal revenue-sharing. The City Councils supported a tax rollback that would enable the Library to replace funds appropriated by the Cities with a long-term reliable funding source. The Library asked the community for a 20-year millage of 1 mill. On Tuesday, May 3, 2005 the voters overwhelmingly approved this millage, and secure funding for library operations and meeting future needs was established. Because of this millage, the Library was able to: Restore open hours to 72 per week, and open again on Friday and Sundays Improve our print and non-print collections Update and expand our Large Print collection for our residents and for the individuals we visit at nearly 40 area senior residences and nursing homes Provide outreach services to preschools and day care centers in the area Offer wireless "hot spot" internet access at both Branches Create an adequate Fund Balance, as urged by our auditors, to address future needs Create a Capital Improvement Fund (paving parking lots, new signage, upgrading computers) Address liabilities in our employee compensation (accumulated absences and other leave payable upon termination) as recommended by our auditors. The Library offered online access to its Catalog under the DYNIX system from 1992 until mid-2008. After DYNIX was acquired by SIRSI, a large academically-oriented firm, it suffered the fate of many acquisitions, in that the product became a sort of step-child and would eventually be reworked into a lesser clone of the firm's own system. Many promised improvements were postponed or not delivered by the vendor, and the Library decided to go out for bids from other library automation vendors, eventually deciding upon POLARIS, a firm specializing in public library systems. On May 14, 2008 we began our use of the POLARIS system for our online catalog. Many enhancements to the user experience have been implemented since then, and we are pleased with the system. The term Information 2.0" or Web 2.0 is commonly associated with web applications that facilitate interactive information sharing, interoperability, user-centered design and collaboration on the World Wide Web. Examples of Web 2.0 include web-based communities, social-networking sites, wikis, blogs, mashups and folksonomies. Tools offered on a Web 2.0 site allows users to interact with other users, in contrast to non-interactive websites where users are limited to the passive viewing of information that is provided to them. Interactive Online Chat with a Librarian available from our Home Page— this has proven a very popular tool. You can ask questions using your own web browser and receive instant answers in an online conversation. When a Librarian is not available, you can leave an email message and we'll get back to you quickly. Our Library also has a presence on social networking sites such as Facebook, Twitter, Pinterest, Tumblr, and Instagram for users of these social networks to connect with us. A customized eNewsletter—sign up on our BookLetters page and choose from any or all interest area newsletters, including Audiobooks, Book Club Choices, Books featured on broadcast media, Business, Fiction Best Sellers, Forthcoming Fiction releases, Meet the Author, Mystery, New Fiction, Nonfiction Best Sellers, Nonfiction Previews, Romance, Science Fiction and Fantasy. "Wiki" comes from a Hawaiian word for fast. Try our Busy Bee Wiki—a rich resource of instant information for child care providers and other early childhood professionals. As a District Library serving the communities of Farmington and Farmington Hills we provide Library Service in two locations. Each of our buildings has its own unique personality, but equally excellent points of service. Comments in our recent surveys confirmed that many users visit both Libraries. /I usually go to the Branch because it is easier to browse, cozier and more convenient. At other times I use the Main Library for the larger collection—better for my research. Our entire staff work together to accomplish the Long Term Goals of the Library and they take pride in our commitment to excellence, as defined in our statement of Public Service Values and our Quality Policy. Our work at the Library is also guided by the American Library Association (ALA) Librarianship and Information Services: Statement on Core Values, adopted by our Library Board of Trustees. We have learned that proper planning will make life easier for the future, and that the Library needs to have strategies in place to assist us in both healthy and difficult budget years. We drafted our last Strategic Plan in 2004 amidst increasing budget cuts and a reduction in hours of Library operation. Financial stability for operating monies was the primary goal of the Trustees Strategic Plan, which was accomplished at a May 2005 election, with voter approval of a dedicated operating millage of 1 mill for twenty years. Today, five years later, we must again consider fiscal needs, generated by a dismal state and local economy, and the need to replace the revenue from an operating millage that ends in 2013. Our strategy for stable funding again must consider timing, education of the public, and the local economy, among other factors. After much community input and thought, our Strategic Plan 2009–2013 was presented to, and received by, the Library Board of Trustees at their November, 2009 meeting, to chart our way into the future. Farmington Community Library has partnered with BidNet Direct as part of the MITN Purchasing Group and will post their bid opportunities to this site. As a vendor, you can register with the MITN Purchasing Group and be sure that you see all available bids and opportunities. By selecting automatic bid notification, your company will receive emails once Farmington Community Library has a bid opportunity that matches your company's business. In addition, the site handles ITB’s, RFPs, and RFQs for other member governmental agencies, districts & authorities throughout Michigan. Farmington Community Library looks forward to providing you with more bid information and simplifying the entire bid, proposal, and quote processes for everyone involved. We appreciate your cooperation and welcome your participation. If you need help registering, please call the MITN Purchasing Group support department toll free 1-800-835-4603. These values encompass many principles and beliefs that may have special meanings or require a different emphasis in each of the varied professional associations representing librarians and information professionals. The following is one interpretation, which may be adopted or revised by these organizations, based on their individual goals and priorities: Connection of people to ideas. We guide the seeker in defining and refining the search; we foster intellectual inquiry; we nurture communication in all forms and formats. Assurance of free and open access to recorded knowledge, information, and creative works. We recognize access to ideas across time and across cultures is fundamental to society and to civilization. Commitment to literacy)1 and learning. We aid people to become independent lifelong learners by selecting and offering materials that support the differing needs of all learners, and that entertain and delight the human spirit. Respect for the individuality and the diversity of all people. We honor each request without bias, and we meet it with the fullness of tools at our command. We respect the individual's need for privacy, confidentiality, and the right of access to library and information services and resources regardless of race, creed, national origin, age, ability, gender, or sexual orientation. Freedom for all people to form, hold, and to express their own beliefs. All people have the right to seek, to know, and to find. Preservation of the human record. The cultural memory of humankind and its many families, its stories, its expertise, its history, and its evolved wisdom must be preserved so it may illuminate the present and make the future possible. Excellence in professional service to our communities. Our commitment requires integrity, competence, personal growth, effective stewardship, and service to our discipline as well as to our public. Formation of partnerships to advance these values. We believe in the interdependence of libraries and librarians and advocate collaboration in all areas and between all types of library, knowing that collections and services evolve successfully through such collaboration. To provide a high standard of services which are user-oriented. To fulfill patrons' informational and material needs, with referral to other agencies as appropriate. To provide materials in a variety of formats which reflect community demand, use, and the Library's own spatial limitations. To make the collections readily accessible, easy-to-use, and representative of all viewpoints. To incorporate in the design of Library services basic concepts from other disciplines, such as education, management, and science. To promote Library services, programs, and materials in the community. To participate in cooperative informational networks or systems for efficient, economical Library services. To provide adequate staff development to meet the service goals of the Library. To recruit and retain a volunteer corps, whose assignments are meaningful to the Library's operation. To cooperate with schools, other community groups, and agencies through direct participation, support materials, or use of our meeting room facilities. To develop a diversified public relations program which will increase Library usage consistent with the resource available and project a positive image in the community. To maintain all facilities in good repair, with consideration given to necessary improvements, safety, accessibility for the physically challenged, and an aesthetically pleasing environment for the public and staff. To direct management efforts toward efficiency in all Library operations to maximize return on the support tax base. The Library facilitates independent learning and encourages the love of reading from early childhood throughout one's lifetime. Information formats and service delivery will evolve as the community's demographics change and technology improves. Our mission statement provides a philosophical framework for the services, collections, and programs offered by the Farmington Community Library. This statement was approved by the Library Board of Trustees in April, 2004. Volunteers are at the heart of Farmington Community Library. Between our two branches, we utilize more than 100 regular volunteers. They help us to provide - free of charge - educational, recreational, and cultural services and programs, and in return, they get the satisfaction of giving back to their community! We are seeking a volunteer aged 18 or older to assist with video game processing. This volunteer transfers the video games into library cases, labels, copies and cuts the cover-art to fit the cases. Involves moving between departments, multitasking, detail orientation, using a typewriter and paper-cutter. Please complete the form below if this type of volunteer work appeals to you. Thanks in advance! For more information on volunteering for the Farmington Library's Teen Department, click here. Thank you for your interest in volunteering at Farmington Community Library. We view this opportunity as work experience and as a wonderful way for you to contribute to the community and gain job skills. Therefore, we expect our volunteers to be responsible, ready to learn new tasks, and to have a personal interest in volunteering. Your time, energy, and talent help us to provide excellent service to our community! To ensure that our volunteers and their guardians understand our expectations, we have an application specific for Teens that needs to be SIGNED by both the volunteer and a parent or guardian responsible for the volunteer. This information applies only to Teen volunteers at the Main Library, located on 12 Mile Road. You must submit a Teen Volunteer Application Form before we schedule you. You can request a form from the Information Desk downstairs in the Main Library’s Children’s Department. Teen Volunteers will be scheduled for one 2 hour shift. After successfully completing the shift, volunteers can be scheduled for the next shift. Volunteers will be scheduled according to the needs of the library. For those needing a specific number of hours by a deadline, please keep in mind that we are not able to accommodate all those that have an interest in volunteering here. If you have any questions or concerns, please feel free to contact the Children’s Department at the Main Library, in person or by phone at (248) 848-4315. Monetary contributions to the Library support the purchase of books and other materials to maintain the Library's status as a premier facility. Donations may be in the form of a memorial or tribute to an individual. Donors may suggest subject areas for purchase if the gift is intended to improve the collection. While specific titles may be suggested, the librarian is charged with selecting an appropriate title that will best meet the collection development guidelines. A general donation may be used for books, audio materials and programs. Your contribution may also be used for a chosen purpose, such as the Children's Garden or membership in the Farmington Friends of the Library. Call (248) 848-4303 for more information. Learn how to make your gift count! All gifts will be acknowledged with a receipt. The staff member accepting the gift should obtain the name and address of the donor, as well as any information concerning a person honored or remembered with the gift. Acknowledgement is also sent to the person(s) requested by the donor, i.e., a bereaved family. Your gift may be tax deductible, please consult with your tax adviser. Tribute Collection: Tribute gifts are a thoughtful way to remember friends and family for special occasions. Your gift will greatly enhance Library collections and resources for our community. Paver Tiles: A paver tile commemorating birthdays, anniversaries and memorials of your friends and family can be part of the walkway to the entrance of the Main Library, with prices starting at $200, depending on the length of the message. Donors' Special Collection: Major donations are recognized with the donor's name engraved on the spine of a book on the bronze bookshelf at the entrance of the Main Library. Lifetime donations begin at $5,000 on the lower shelf, $10,000 on the middle, and major contributions on the top Endowment Shelf. Donations for the Farmington Friends of the Library section are $2,500 for the lower shelf, $5,000 for the middle, and major contributions for the top Endowment Shelf. Endowment Fund: This is a self-renewing resource in which the gift's principal is invested in perpetuity with a portion of the interest income used annually for a stated purpose. Wills and Bequests: A planned gift to the Library offers an opportunity to create a meaningful legacy consistent with your personal values and financial objectives. An attorney, accountant or trust officer can provide assistance as you plan your gift. We recognize that ALL donors, regardless of the size of their contributions, share a passion for reading and learning that collectively support our Library mission: ". . . .to facilitate independent learning and encourage the love of reading from early childhood throughout one's life." Your gift may be tax deductible, please consult with your tax advisor. Patrons have also been generous in donating books, other Library materials and equipment to the Library. Such generosity is a major source of paperback books and an excellent source of titles not owned by the Library. Any material given to the Library may be added, and later removed, from the collection based on the Library's Collection Development Guidelines. Those items which cannot be used will be sold in the Friends of the Library Book Sale, whose funds support the Library, or given to other non-profit or charitable organizations. Gifts of artwork, personal property, equipment, real estate and stocks may be accepted at the discretion of the Library Director if such terms or conditions are acceptable to the Library Board of Trustees. Gifts of computer hardware are accepted at the discretion of the Coordinator of Technology, since the Library's requirements change with technological development and enhancements. The Library staff may be able to suggest other organizations which will accept older hardware. If you have books or other materials to donate, you may wish to call ahead (248) 553 0300 to arrange for someone to assist you in carrying items into the building and obtaining a receipt for tax purposes.